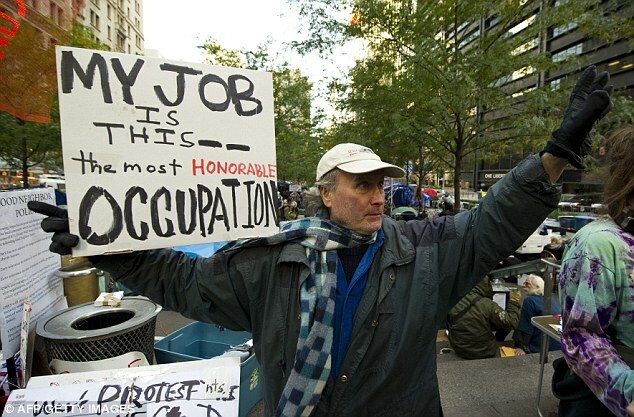 A New York City café owner says the Occupy Wall Street movement is killing local jobs. 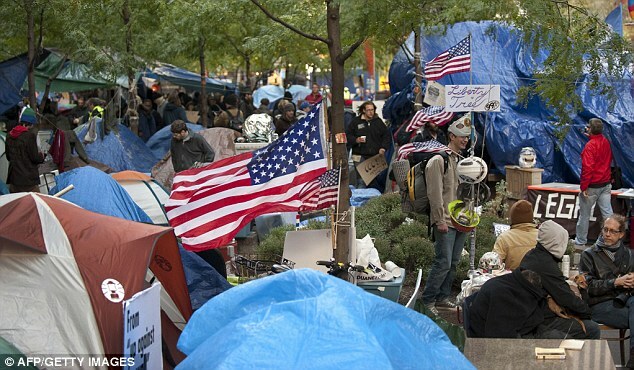 Mark Epstein, owner of the Milk Street Café in Manhattan’s Financial District, has fired 21 employees since demonstrators – calling themselves the ’99 per cent’ – began their ongoing encampment in Zuccotti Park. 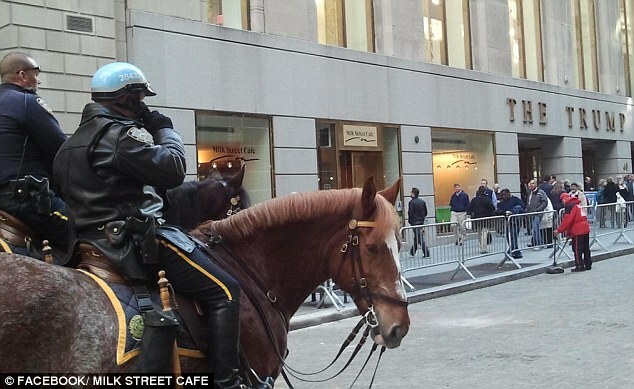 He says police barricades that line Wall Street – put in place to keep protesters out – are also blocking potential customers from coming inside. Mr Epstein said his Boston-based café has a 30-year history. He opened the Wall Street branch in June after signing a lease with the Trump organisation. He hired 100 employees and borrowed money for the upstart. The only restaurant in an area next to a pedestrian plaza, he said business was booming – at first. But soon after the encampment set up on September 17, Mr Epstein said business has slowed to such a degree he’s not sure if Milk Street’s doors will stay open. Mr Epstein said the restaurant has a capacity of 150 seats; now, at the height of lunch hour during the work week, the food court is half full; as a result, it now closes six hours early. ‘We eliminated 21 positions in the company. First time in 30 years I’ve laid anybody off,’ he told the network. The owner says he is apathetic about the protesters’ point of view. As DNA reported, the local Community Board passed a resolution last month which called for New York City police to remove ‘all non-essential barricades’. But today they still stand in front of his establishment. An Occupy Wall Street spokesman refuted reports the movement, whose members claim to be fighting against corporate greed and economic inequality, pointed critics to the NYPD. Meanwhile, In a clash of New York City mayors past and present, Ed Koch and Michael Bloomberg took opposing sides at a panel discussion on the protests, with Bloomberg coming to the defence of banks and Koch angrily calling for criminal prosecutions of corporate executives. ‘It was not the banks that created the mortgage crisis. It was, plain and simple, Congress,’ said Bloomberg, a former executive of a financial information company, at the event for business leaders. Koch responded by noting that major banks have been fined hundreds of millions of dollars. ‘What do you think they got fined for? Schmutz on the sidewalk?’ he asked in his signature New York twang, using a Yiddish term for dirt. Former Mayor David Dinkins, also on the panel, stayed out of the discussion of the protests saying he would leave it to the experts to debate fiscal matters. An online payment service says more than 8,000 donors from 37 countries have contributed money online to Occupy Wall Street since the movement took off several weeks ago – spreading to states across the U.S. and countries abroad, including California, Iowa and England. WePay said earlier today that about $325,000 had been donated as of October 27. 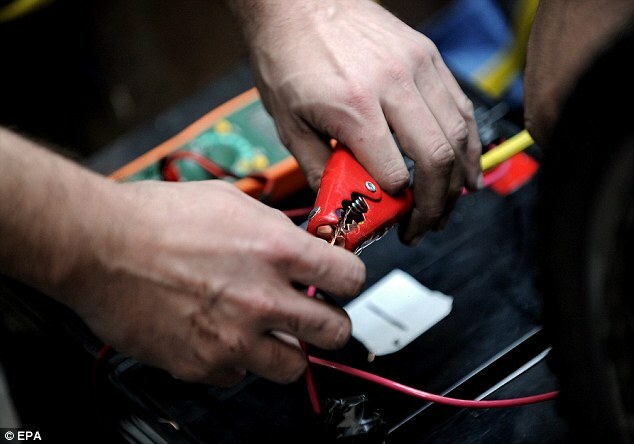 Demonstrators in New York, however, have been left to look for alternate ways to power their lighting, laptops, phones and heat sources after the city’s fire department removed protesters’ electric generators a number of days ago. 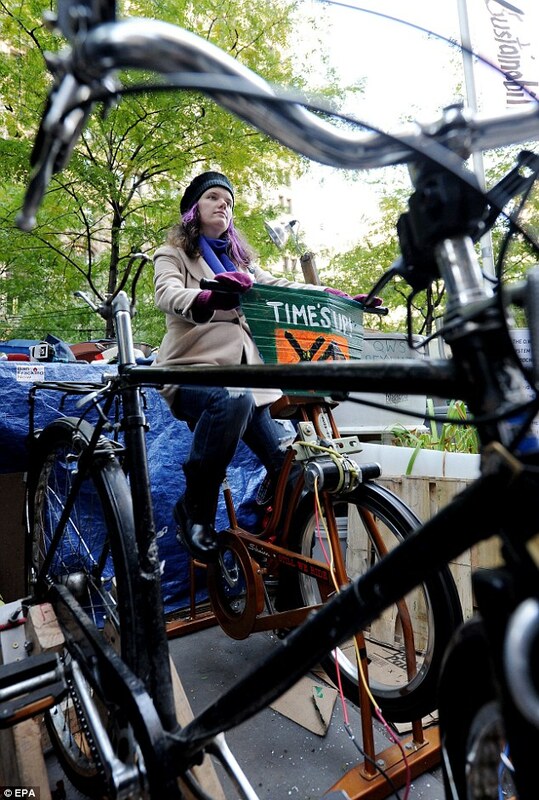 Protesters were seen at Zuccotti park today pedalling a bike-powered electric generator at the encampment. About 40 vendors who sell on the City Hall lawn every Thursday were forced off the property after Occupy L.A. protesters refused to remove their encampment. The irony of the mini-businesses being hurt isn’t lost on the demonstrators. The Occupy movement came to Los Angeles aiming for Wall Street titans, but farmers market vendors are the first to take a real hit. Two weeks ago, about 40 vendors who sell on the City Hall lawn every Thursday were forced off the property after protesters refused to remove their city of tents. The mini-businesses — produce farmers, popcorn poppers, flower sellers — were abruptly moved by city officials to a new and less visible location across Main Street. Since that relocation, profits have plummeted, vendors have pulled out and shoppers have become scarce. Many vendors, who already struggle to make it through the slow winter months, have reported a 40% to 60% drop in sales since the move, said market manager Susan Hutchinson. So far, three have decided to quit showing up until the demonstrators are gone. The irony is not lost on Occupy L.A. protesters. The decision was made through a vote Oct. 19, she said. Close to a hundred demonstrators cast votes. Nearly everyone agreed to move, but a handful did not. Because decisions required unanimous approval, the handful won, Fennelly said. “Some people cried because they were so affected,” she said, adding that the voting rules have changed: A 90% majority is now required. Fennelly said protesters have tried to help the market by announcing its new location on Twitter and Facebook. For vendors, some of whom travel from as far as the Central Valley, the publicity is little consolation. As with real estate, they say, location is key. The 6-year-old market had struggled to find a good spot to sell, Hutchinson said. It started in the Arts district but shut down after six months because of a lack of customers. Then it moved to Little Tokyo, where nearby businesses complained of the competition. Finally, in 2007, with help from City Councilwoman Jan Perry, the vendors set up shop on the south lawn of City Hall. There, business was thriving. From 9 a.m. to 2 p.m. on Thursday, workers descended from City Hall and surrounding high-rises to enjoy lunch, shop and listen to music performances. When that will happen is unclear, because protesters have shown no sign of budging. City Hall officials, who initially embraced the occupation, told demonstrators last week they can’t stay indefinitely. So far, they have not figured out what to do about them. Until then, Jorge Zaragosa plans to steer clear of the market. For six years, he had traveled 60 miles from Oxnard to sell his fruit and produce. The second week of the protest, he went home with only $180 and a truck full of strawberries, broccoli and other goods. That’s when he decided to bow out. For Silvia Ibarra, who drives from Downey to sell $5 jars of honey, the displacement has cost her a day’s pay each week. Two weeks ago, when the market first moved, Ibarra made $9, 10% of her usual sales. Worried about losing money, her bosses at Aunt Willie’s Apiary told her to stop going to the market. Set back in a paved plaza off Main Street, Lopez, the owner of A Taste of Baja, hopes his faithful customers will track him down. Lopez, like other vendors, bounced from one farmers market to another. But he counted on the City Hall setting to deliver his greatest earnings: about $1,200 per day. People lined up for his ceviche and shrimp tacos, recipes borrowed from his mother to launch the business two years ago. On the most recent Thursday, he made about $500, just enough to cover his costs. The night the protesters took their vote, Lopez visited the camp with Hutchinson in hopes of reaching an agreement, but he said he left upset and confused. “Too many chiefs and not enough Indians,” he said. But Lopez plans to keep selling from his taco and burrito booth. 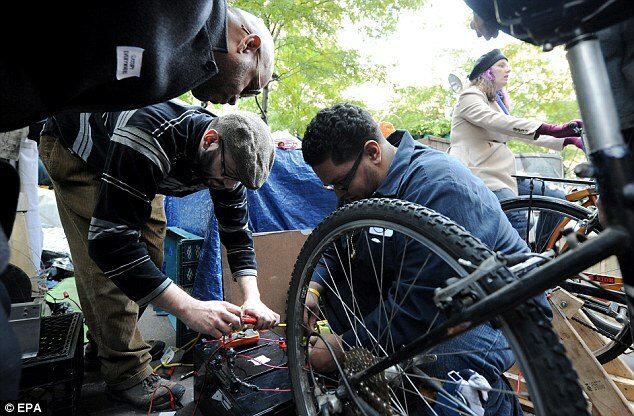 The Occupy people have already taken craps on everything else around them; why not crap on little people’s jobs too? You go ahead and tally up the jobs the Tea Party protesters directly destroyed, you liberal chunks of cockroach crap. Let’s not forget the extremism and mass violence we are seeing in this movement. You know, versus the ZERO VIOLENCE from the Tea Party that somehow got labelled “violent” and ‘extremist” by the liberal mainstream media propaganda. This entry was posted on November 2, 2011 at 6:00 am and is filed under Democrats, Economy, first Jeremiah Wright term. You can follow any responses to this entry through the RSS 2.0 feed. You can skip to the end and leave a response. Pinging is currently not allowed. I had to do errands and forgot to mention that the Occupy Wall Street is similar to the French Revolution where it started with good intentions but quickly turned into mob rule where things were actually safer with the King and Queen in charge. In the French Revolution once the king was off the throne a lot of groups often turned on each other and became a dog eat dog world. At least with the American Revolution while there was some mob stuff most of the people had a clear and consistent vision not wavering unlike Obummer who says one thing and does the opposite such as not reading the 200+ page Stimulus package. Did you know in 2014 part of the plan is to ban wood stoves and this includes pellet stoves. You also won’t be allowed to sell them either. They’ll have to go to the dump because in their minds woodstoves are harmful to the environment. Problem is that most of the Eastern and NorthEastern USA relies on woodstoves when there is power outages and to help with heating bills because of how cold it gets so they’ll all have to switch to oil or *gasp* coal! That’s weird. The second comment asked for my login to WordPress even though the first comment went through just fine. *Looks around and the police officer has left to go to the bathroom* Phew! The French Revolution is to liberal, secular humanist Democrats what the American Revolution is to conservative, God-fearing Republicans. The French Revolution embraced all the same vile, evil, demon-possessed crap that the Democrat Party does today. And the Democrat Party will lead America to an even greater hell than the liberals who created the Reign of Terror led France. And you’re right about Democrats hating on the American people. Nearly half of America’s electricity comes from coal, but Democrats want to murder that half of America by forcing them to freeze in the dark.